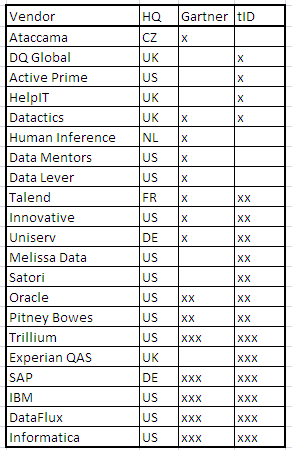 How do analysts look at the data quality tool vendor market? As with everything data quality there are differences and apparently no single source of truth. Gartner has its magic quadrant. They sell it for money, but usually you are able to get a free copy from the leading vendors. The Information Difference has its DQ Landscape in the cloud for free. The number of x’s is a rough measure of the ability to execute / market strength. Three smaller vendors are considered by Gartner, but not by The Information Difference and vice versa. Two midsize vendors are included by The Information Difference, but not by Gartner. Experian QAS are included as a big one by The Information Difference, but did not (yet) meet the inclusion criteria used by Gartner. This is a useful synopsis – these analyses can be a useful mechanism to identify potential vendors once a proper needs analysis has been done. However, customers should be cautious about selecting a vendor purely on the basis of a ranking from one of these vendors. At the very least, the full report should be considered as the text cautions can paint a very different picture to the positioning in the diagrams. 1.) First correctly understand your needs. A large corporation looking for an enterprise solution to support its global operations needs a very different solution to a small business looking for an address clean up. Will a tactical solution bought to, say, support an ETL process in the warehouse, scale to support real time integration into the MDM platform in three years time? Is this important? 2.) Look beyond the technology to understand the vendor’s philosophy and focus. Data quality is about an organisational shift in behaviour, supported by technology. Does the vendor that you are selecting have a genuine focus on addressing data quality issues, or have they simply acquired a solution in order to tick a box on the Gartner score sheet? Ultimately, unless your business has the in-house experience to deliver data quality you will need support from the vendor that goes beyond simply selling you some software licences. You may struggle to get this from vendor’s that do not have a data quality focus. These are very good points Gary and points to what data quality tool vendor difference really is. Both the Gartner piece and The Information Difference site also have a comprehensive list of smaller vendors specializing in certain geographies, certain industries, a certain domain or other niche.